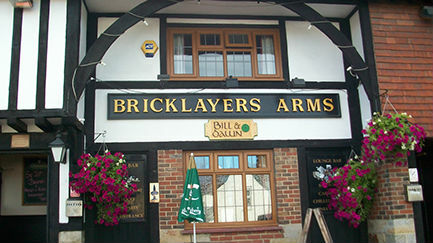 The Bricklayers Arms Pub based in the heart of Crowborough East Sussex. We are a traditional pub who invites you in to warm friendly atmosphere. We have a great mix of people who join us in the Pub, catering for all age groups 18 till 99 years old. Relax over a pint of real ale or glass of wine whilst enjoying delicious home cooked food, with traditional favourites to choose from such as sausage and mash, home made Pizza`s and our scrumptious roast dinners on Sundays. For something a little livelier you can enjoy our Live Music which is on most weekends throughout the year. We pride ourselves on inviting bands from the local surrounding area with a large range of music styles to suit every ones tastes. If you like a game of pool we have just installed a brand new Pool Table and our darts board is always ready for action. Sports Fans come and have a pint and watch Live Football and Rugby on every weekend throughout the sporting season.